In the last decade i.e. before the year 2010, people used windows software and social networking websites to find a date. Mobile phones have changed the picture completely. Now, you can easily find a date online with a mobile phone application. The dating apps use GPS module of your mobile device to detect your location. Then, they look up into the database to find users within 1 to 2 kilometers radius of your vicinity. When the app finds a relevant profile, it compiles a list of nearby people and displays the same on the screen of your phone/tablet. Apart from location, the apps use the information you’ve entered in your profile to recommend people. The algorithm that powers the applications use various factors in suggesting profiles. Hence, people who meet through dating apps are more likely to fall in love with each other. As you have control over the app, you can go through several profiles and shortlist one profile that you find interesting. The dating apps allow you to see the display picture of your would-be date. They enable you to send messages to him/her. Here’s the list of the best applications for Android and IOS devices. Tinder is the most popular dating app in the world right now. 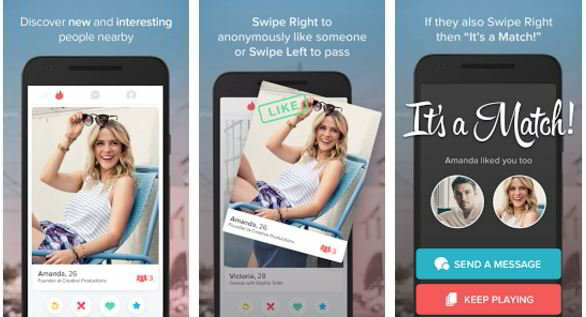 When you start Tinder, you will see three slides which explain the features of the app. Below each slide, you’ll find a large blue button to sign in with your Facebook account. Click this button and Tinder will show a popup box with a message to allow tinder to access your location. Tap the allow option and the app will begin finding people within XYZ kilometer’s range of you. The app takes just a few seconds to find people. Tinder lets you upload a profile picture. You can set your qualification and school/university in your profile. The app lets users invite other people. It has settings panel where you can change discovery settings, search distance, and change find people in certain age groups. It lets users connect their Tinder account with their Instagram profile so that they can easily change pictures. Tinder app started its journey in 2011. It has become the best dating apps ever. According to the developers of this app, Tinder app user swipe 5+ billion times every month. Gender, age, work, and studies. Job profile, school, About yourself. Happn app is similar to Tinder. It lets users connect their Instagram account with Happn. In addition to Instagram, this app also supports Spotify. It offers similar settings like Tinder. It has a special feature called charm through which you can let other people know that you like them. Grindr is an app designed exclusively for the gay community. The app is lightweight. It is fast and must have app for men interested in dating other men. Grindr provides a grid interface that displays profile pictures of 100 users. This application allows users to share personal images. You can start a conversation with a person whose profile interests you. Grindr has a module to block accounts of other users. If someone is trying to create a connection with you forcibly, you can use this feature and stop worrying about him. Grindr allows you to save profiles that you like. You can access the details or see the picture of the user anytime. Grindr has a large number of users. According to its creator, over 1 MN men use this dating app every day. Once you enter the details mentioned above, complete the task of creating a profile. Now, you must fill all important details in your Badoo profile to increase the chances of a guy/girl selecting you as a date. After entering the details, upload your best display picture and use the people finder function in Badoo to discover new people. This dating app has advanced filters, with which users can shortlist profiles that meet their requirements. Badoo lets you strike conversations, rate pictures and discover interesting personalities. 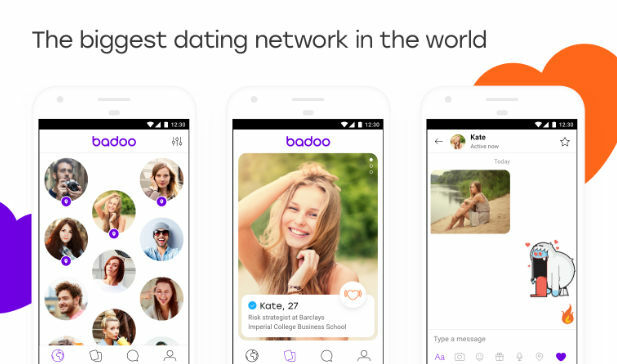 Because of its cool features, Badoo is one of the best dating apps for 2018. TM is one of the best dating apps in India. It is powered by a special algorithm which allows users to find their perfect date. 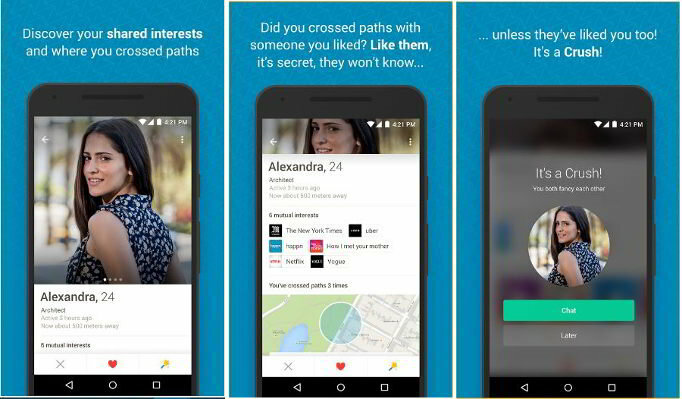 The app has some cool features that you’ll not find in Tinder, Happn, Grindr, and Badoo. The “datelicious” feature in this app lets you plan your date and discover restaurants nearby you. You are not allowed to download profile pictures of other users or take its screenshot. Truly Madly lets users verify their social network profiles. It has a special Truescore rating which improves each time you verify your FB, Twitter, LinkedIn account, phone number, etc. It has a beautiful UI and provides a great experience of online dating. 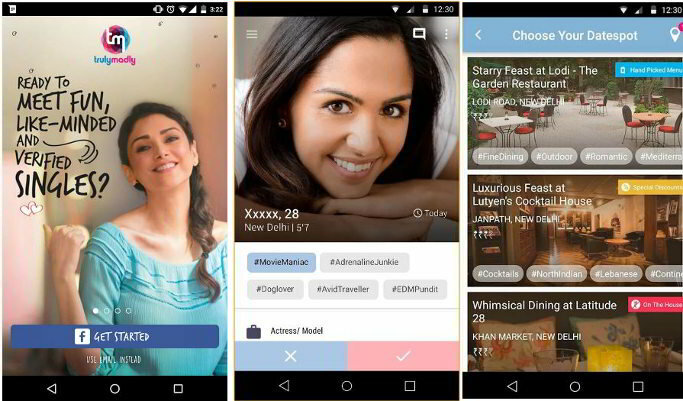 Woo is yet another widely used dating app in India. It is designed especially for singles looking forward to meeting new people. WOO app finds and recommends like-minded people to you. If you like someone, simply tap on the tick mark. If another user responds in the same manner, then there’s a match. In WOO, only the persons who like each other can exchange messages. If you find a person’s profile impressive, you can let the person know about this by sending a crush along with a direct message. 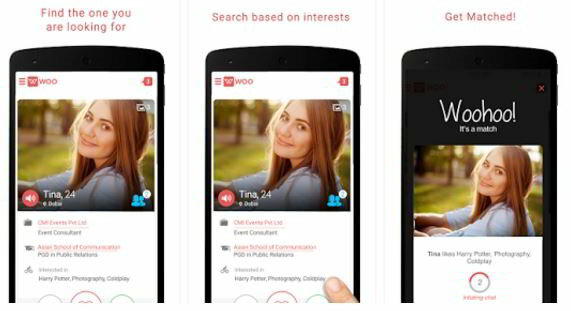 WOO has many interesting features that make online dating in India fun. Conclusion: If you are searching for a life partner or a date with whom you can express your love, feelings, emotions, make sure that you download the best dating apps we have shared above. The apps are suitable for people of all age groups. They are free and intuitive.